Fellow travelers, it may be time to get excited about the prospects of a special laptop bag that would not require the laptop to be removed at an airport TSA screening. "Okay, third time's the charm -- here it is, a pre-production picture of the Skooba Checkthrough TSA-approved bag, direct from Skooba's CEO, Michael Hess. Michael got in touch with after our last post to say that the Checkthrough will indeed be a multi-pocketed bag and have several unique and patented features, including a specal 3-1-1 liquids compartment and a see-through window for rapid ID of contents. There's also a number of minor changes coming to the design, but no matter what, you should be able to get through security without having to take your laptop out of your bag." 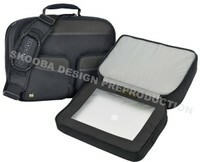 It's not at all clear how a TSA screener will know that this is an approved bag that won't require removing the laptop. I can easily see it being a hit-and-miss Russian roulette proposition every time one goes through a screening. "Will they or won't they?" stress will be the name of the game. So it may make the bag an iffy proposition, at least for early adopters. 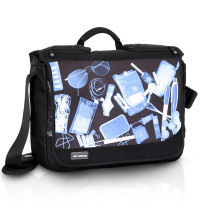 No word on when the bag may be available, but if you're impatient, you may want to go with the Skooba Skreener for now, which features an X-Ray image of stuff in a typical bag, as a design touch. And NO, it's NOT a Checkthrough TSA bag. Also, you'd better hope the TSA folks have a sense of humor.